OpenStreetMap (OSM) is a global, free and openly accessible database of geographical features . It is a popular example of projects that create Volunteered Geographic Information (VGI) [2, 3], where anyone can contribute to the data and the underlying data scheme through collaborative participation [4–6]. The size of the OSM project in terms of the amount of data, the number of contributors, users and applications building on the data has grown considerably since the beginning of the project in 2004. The dataset has undergone constant changes and its geometrical and attributional details are continually evolving. This process of data refinement is spatially heterogeneous, resulting in regions of varying data quality. The aforementioned research questions share a common characteristic: they can be approached by examining the evolution of the data. One advantage of the OSM project is that it provides almost the entire editing history of its global data evolution. 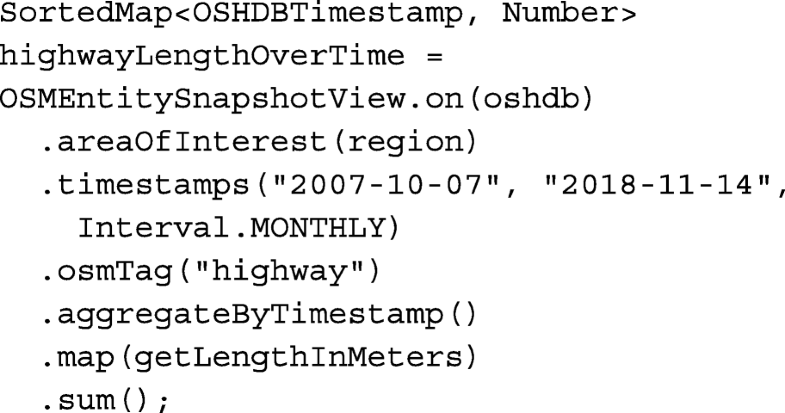 This dataset is large and, thus, generally hard to handle. Consequently, it is not utilizable for many potential users. Although many software tools [7–25] address this problem partially, none of them is able to provide the following range of functionality in one single integrated tool: fast and easy reconstruction of historic geometric and semantic states of the data as well as fast spatial, temporal and tag queries. 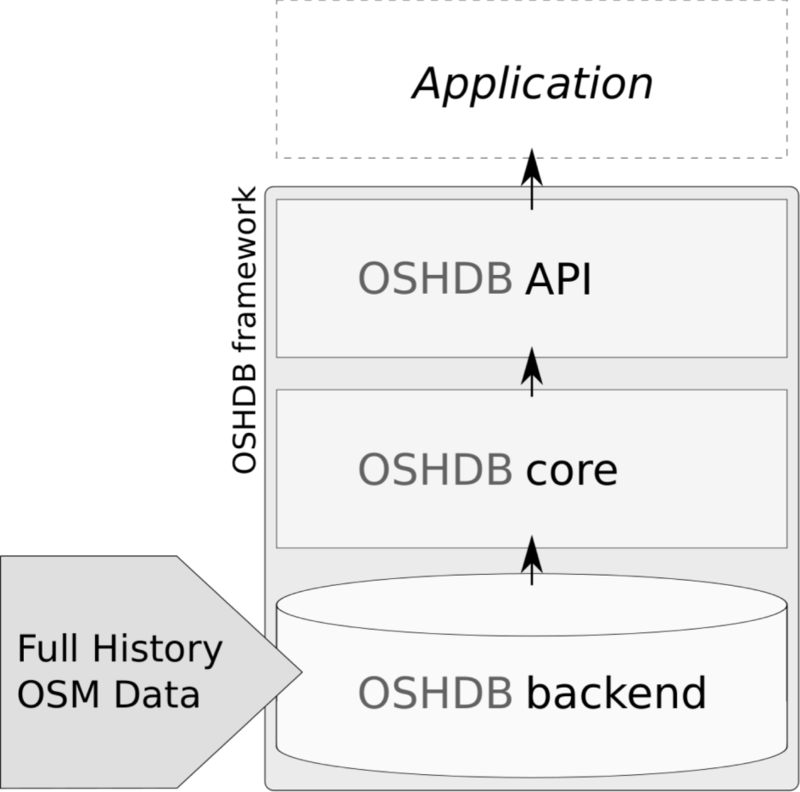 Therefore, we developed a framework called OpenStreetMap History Database (OSHDB). It is capable of handling this large dataset and provides the necessary tools to perform Online Analytical Processing (OLAP) tasks related to the history of OSM data in a user-friendly and scalable way. In recent years, several studies utilized the history of the OSM dataset, e.g., for conducting intrinsic quality assessments in cases where comparison datasets do not exist [26, 27]. Intrinsic quality indicators have been developed to evaluate the fitness for purpose of OSM data [13, 17, 18, 24]. Further studies assess the behavior of OSM contributors and contribution patterns [5, 28–31]. The parallelization of algorithms is hard to achieve in general, in particular when the user is not familiar with corresponding concepts. Side effects can, e.g., only be parallelized with good knowledge about when side effects occur and if the processes running in parallel are synchronized in some way. The functional programming paradigm prohibits side effects when followed strictly. In addition, it can be traced in which order computations need to be executed, and which computations can be performed in parallel – such tracing is often performed using abstract syntax trees in case of functional programming languages. The OSHDB-API follows the functional paradigm, which is why it allows a straight forward implementation of the MapReduce principle [38–40] in the backend.